Welcome back Huskies! There are so many opportunities for students to get involved at the UW Botanic Gardens. How would you use an interactive map in the Arboretum? After a year of surveying Washington Park Arboretum grid points and digitizing paper maps we have made substantial progress on our georeferenced database project. See photos and a video of Botanic Gardens Director Sarah Reichard. According to Cliff Mass, UW meteorologist, our past winter of 2012-2013 was the most “boring” on record. There were no major weather events such as wind storms, artic blasts, snowfalls in the lowlands or major flooding. This was indeed good news for the UWBG horticulture staff. The January 2013 edition of BGjournal features an article on the restoration work UW students have accomplished as part of the Restoration Ecology Capstone course sequence. The capstone works with community partners to accomplish restoration projects in and around Seattle. Capstone projects have helped to restore 15 acres of the Union Bay Natural Area, a former landfill. she started her Master’s work at UW. What do the pre-school kids do while attending the Fiddleheads Forest School at the Arboretum? UW student Mackenzie Urquhart reports on this exciting new education program. 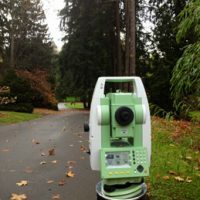 On a sunny autumn day a team of UW students, UWBG staff and team leader Jim Lutz headed down the East Arboretum trail to the Meadow with a shiny, new total station. November 3-4 is the final weekend for experiencing the amazing sound installation by Abby Aresty. The installation comes down November 5. I never thought weeds would be so endless and time consuming but I certainly have a new perspective on weeding after many back-breaking hours digging out seemingly endless little green plants. All of the planting and weeding that I have done and will do take place right outside the greenhouse in a secluded part of the Arboretum used for plant propagation.